At Comrex, we love happy customers. And these days, Washington, DC-based NPR is one of the happiest! 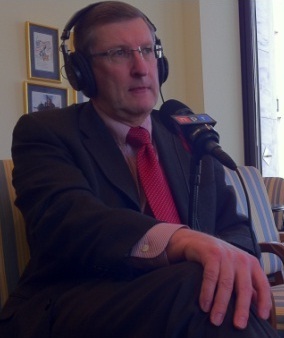 On the April 7th broadcast of the public broadcaster's program, Talk of the Nation, United States Senator Kent Conrad (pictured below) was able to participate in the program live and in full studio quality thanks to NPR producer John Asante who grabbed his ACCESS 2USB and a Verizon 4G LTE card (Pantech's UML290) and set up the gear in the Senator's office at the Hart Senate Office Building. "I don’t know how things went behind the scenes, but on the air Sen. Conrad’s connection sounded great! Thank you for the help, and I hope we can make more use of this technology. Especially in cases like this where congress people can’t leave their offices." NPR used the same technology combo on its flagship program, All Things Considered. The April 21st broadcast featured a segment with White House Correspondent Ari Shapiro who was literally on the move after President Obama's visit to Facebook headquarters in Palo Alto, CA. According to NPR Director of Operations, Charlie Mayer, "A month ago—before LTE—this interview would have been on a cell phone. The listening experience for our audience would not have been so good. This is a preview of what we can expect from the 2012 election season. The campaign trail is where the mobility of the Comrex ACCESS and the speed of LTE change how we work and the quality of what we put on the air."